Wake up and smell the mushrooms!!! Wait, am I spelling that right? Mushrooms, not sugar? Not creamer? Not even coconut oil? Coffee and mushrooms seems like a natural duo if, say you were born in Finland and foraged for mushrooms in the forests—making you a Finish forest forager—because the average Finn drinks five cups of coffee a day and, apparently, eats a lot of mushrooms. Proximity being what it is, a guy named Tero put the lime in the coconut, as it were, and drank them both together, which led him to creating Four Sigmatic, a kick-@ss company that sells mushroom/coffee combos as well as other ‘shroomy things to eat and drink. 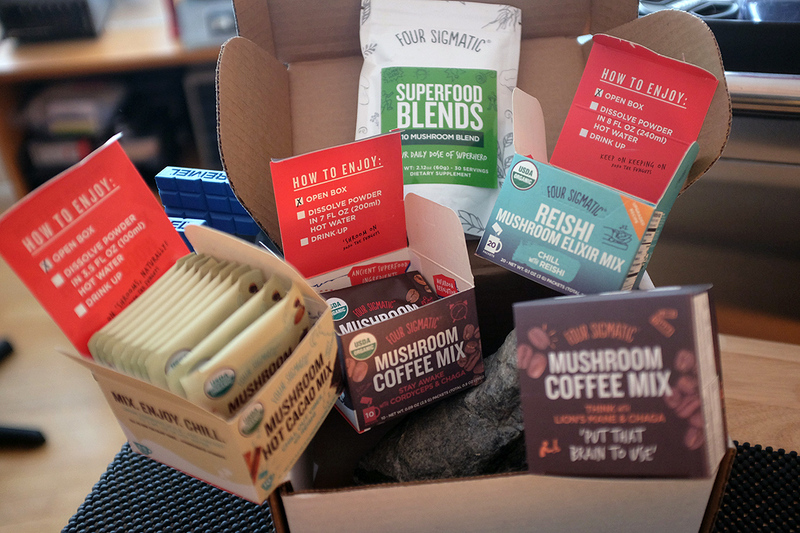 RainyDayKitchen was recently graced with a box o’ boxes from the company, containing two coffees, one hot cacao, one elixir, and a bag’o blended mushrooms, for our reviewing pleasure. 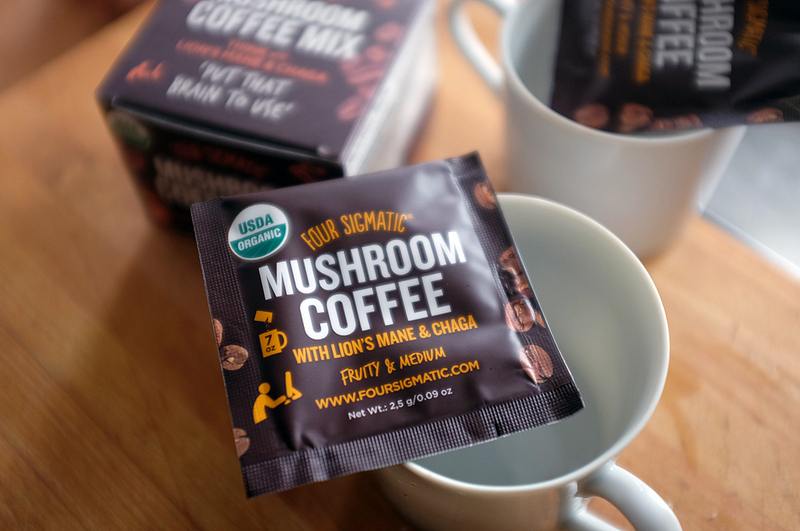 The Mushroom Coffee Mixes we received were Lion’s Mane & Chaga and Cordyceps & Chaga. 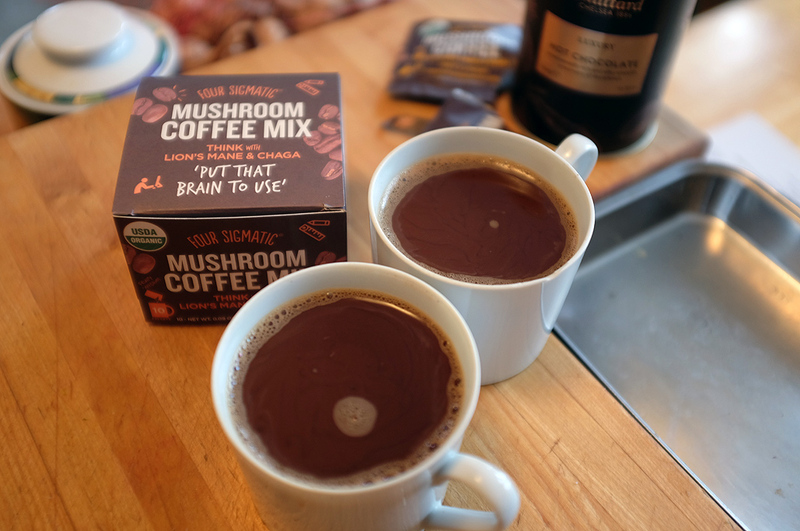 The RainyDayKitchen crew were, hesitant, to try these mixes, not because of the mushrooms, but because of the coffees. All of us know there is no such thing as “good” instant coffee. 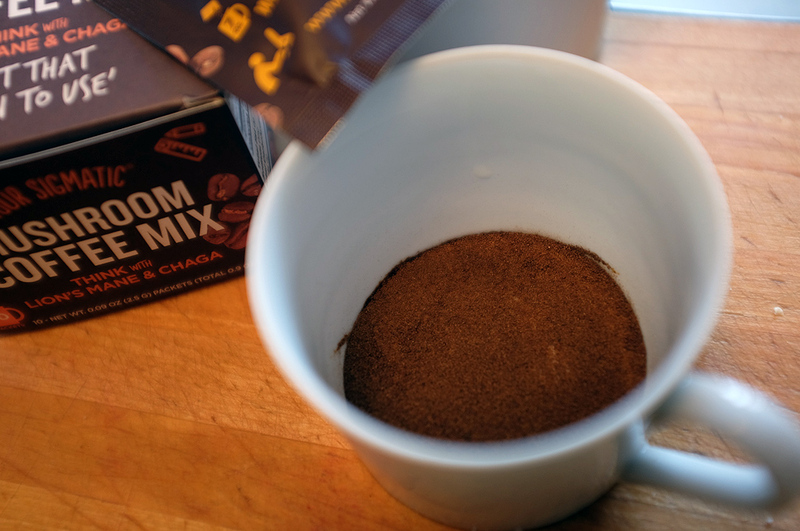 Turns out, these mixes contained not freeze-dried instant coffee, but spray-dried coffee powder, a completely different animal, that was surprisingly tasty. No, neither one tasted or smelt of mushrooms. The aroma was heady but not savory (one kind of expects anything made with mushrooms to give off a savory mustard-would-be-good-with-that aroma). Enjoyable and pleasant (that is not faint praise). The thing we definitely noticed was that, regardless of mix, the coffee impact was much more controlled and stable, unlike with nothing-but-the-coffee version where there’s a spike and then a precipitous drop. Lion’s Mane has been studied and shown to improve brain function. Chaga is an immune booster. And coffee is coffee. While I can’t say that after drinking the Lion’s Mane coffee I finally solved for Pi, it could be that I got a lot of my mental work accomplished. Four Sigmatic doesn’t claim that their products turn you into Einstein’s cousin, but it does rely on scientific studies and personal experience to guide their ingredient combinations. Cordyceps gives you energy and stamina; chaga and coffee offers the same things no matter which mix they’re in. The Cordyceps coffee is meant to increase your physical stamina, not your mental one (so much). One cup might not make you a speed-walker, but perhaps a consistent daily dose will. Not every mix offered by Four Sigmatic contains coffee. Some are made only of mushrooms, others are made of mushrooms + tasty delicious stuff. The Reishi Elixir and the Hot Cacao Mix were ours for the tasting. Reishi Elixir is meant to be sipped at night (no coffee) because the mushroom is known to activate sleep cycles. The majority of the reviewers on Four Stigmatic’s website said it either helped them “unwind” or that it was “calming” and contributed to their being able to get to sleep. Cacao is what cocoa is before it becomes cocoa (note the vowels and you won’t screw up the order). Cacao is from the bean of the tree, cocoa is further along the processing line and includes other things like sugar and whatnot. Cacao is full of good things, and this is mixed with Reishi (see Elixir, above), and meant to be used as a before-bed wind down. The entire Kitchen crew really liked this Mix—it was like hot chocolate but without the calories. ZZZZzzzzz. Wanna make a cup of mushroom broth? Go ahead. Wanna make your own coffee/mushroom mix? Be my guest. 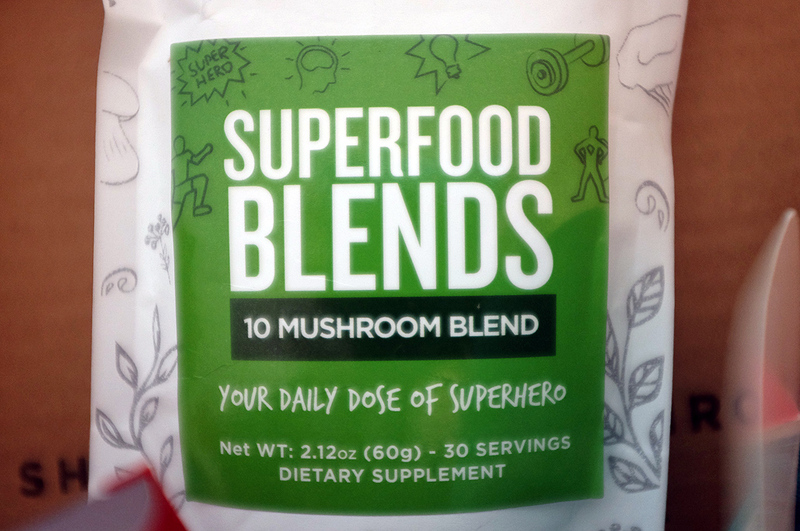 Whatever you want to do to add the health benefits of mushrooms to your life, this bagged blend will allow you to do it. With so much mushroomyness in this blend there might be a slight, fungal, aroma, but it’s not how you say, woofy. Go ahead, blend your head off.